Pocket Mobile Casino is all about small scale, it’s what you call compact entertainment. Unlike those mobile casinos that bombard players with lots of options, this one is more nimble and easy to work. That’s why I like this website. It’s not one of the big gaming sites and it doesn’t try to be. It’s the proud alternative. Pocket mobile slots and games is another way to play online casino. Quick and quirky. If you’re not familiar with Cozy Games Management, it’s the people who run Pocket Mobile Casino. Cozy Games is also the software used at this mobile slots website. That means players can enjoy 100 plus mobile games and deposit using the likes of PayPal and Boku. As I said earlier, it’s not the biggest of casinos but there’s some plus points. I think the original games, website design and ease of use are worth mentioning. What’s good? Original slots from Cozy Games and how easy the website is to use. What’s not so good? Game selection is limited with very little casino games and the slots variety could be improved. Because Pocket Casino is small, it’s incredibly simple. The dashboard is neat and I think the colour scheme suits the website. You can login, register or view the main menu which can found at the top left of your screen. Bang in the middle is the Pocket mobile slots and casino welcome bonus, as is the terms and conditions for that bonus. 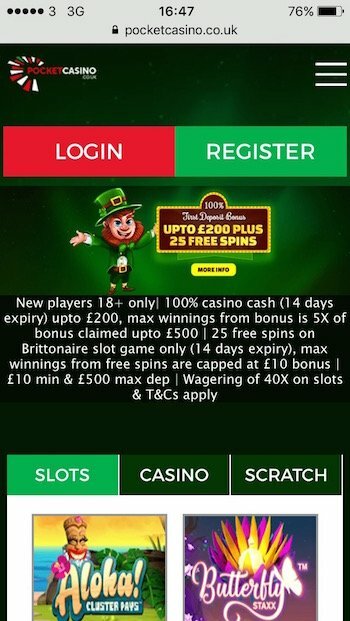 If you can take your eyes of the lucky leprechaun and his bonus offers, there’s some featured games on the home page too. It’s not clear whether these are popular or just what the casino is recommending us to play. I also found this frustrating as despite saying slots, casino and scratch cards, when you select them they don’t seem to change? You can overcome this by using the main menu of Pocket Mobile Casino. In here you’ll find slots, casino, scratch cards, promotions, contact for support and responsible gaming information. It doesn’t take long to join with a simple form, there’s age verification and some more checks before the deposit phase, but it’s all swift and cleverly automated. As it’s a Cozy Games Casino, it taps into the Mobile Casino Network. It might sound confusing, but it’s basically the library of games that Pocket Casino uses. You can play more than 100 mobile slots, casino games and scratch cards at the website. Slots with different pay lines, themes and features. Not only does this include the strange and wacky originality of Cozy Games Slots, but big games from NetEnt and Microgaming amongst others. You can play slots from as little as 10p a spin, play progressive jackpots or scratch virtual scratch cards to win huge prizes. And it’s all very well done on your mobile. My only whinge is that the casino games selection is very lightweight. 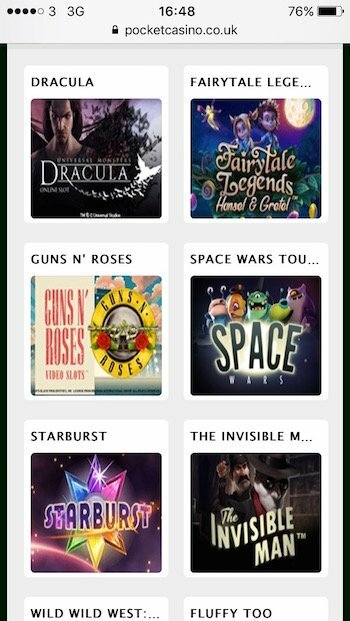 There doesn’t seem to be roulette or blackjack and they’re the two most popular mobile casino games. The guessing games however might be right up your street, the likes of jacks or better and aces & faces can be good fun. I don’t have any real issues with the banking at Pocket Casino. The set-up is bog standard but deposit methods such as Boku and PayPal help boost the score. Big cards such as Visa and MasterCard are also accepted as is E-wallet favourite Neteller. As for deposits, there’s a minimum deposit of £10 and a maximum deposit of £500 at this casino. If you’re using Boku pay by mobile, the maximum deposit is £30. It’s worth noting that if you have a balance of £250 or more, you won’t be able to deposit any more into your account. Pocket mobile casino aims to process withdrawals within 3 working days after the request has been received. (That’s Monday to Friday). Bank processing times are approximately 5 – 7 working days so that could mean up to 10 days in total. Pocket Casino is operated by Cozy Games Management and therefore offers email and 24/7 live chat support. My tip is to use live chat over email, unless it’s a financial query and you want to keep track of your solution. The look and feel of Pocket mobile slots and casino is cleverly cool. While not the biggest website or the most well-known, it offers a unique take on mobile gaming. With some handy deposit methods and original games up its sleeve, players will enjoy this entertaining and easy to use mobile casino.